Western blot analysis of extracts from various cell lines using PTEN (D4.3) XP® Rabbit mAb (Biotinylated). Immunoprecipitation of PTEN from HeLa cell lysates using PTEN (D4.3) XP® Rabbit mAb (Biotinylated) and Immobilized Streptavidin (Bead Conjugate) #3419, followed by western blot using PTEN (D4.3) XP® Rabbit mAb #9188 and Mouse Anti-Rabbit IgG (Light-Chain Specific) (L57A3) mAb #3677. 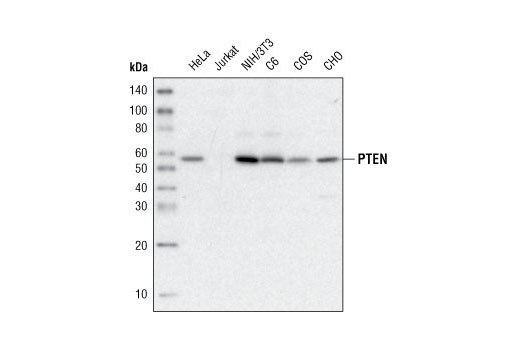 PTEN (D4.3) XP® Rabbit mAb (Biotinylated) detects endogenous levels of total PTEN protein. Monoclonal antibody is produced by immunizing animals with a synthetic peptide corresponding to residues in the carboxy-terminal sequence of human PTEN protein. This Cell Signaling Technology (CST) antibody is conjugated to biotin under optimal conditions. The unconjugated PTEN (D4.3) XP® Rabbit mAb #9188 reacts with human, mouse, rat and monkey PTEN protein. 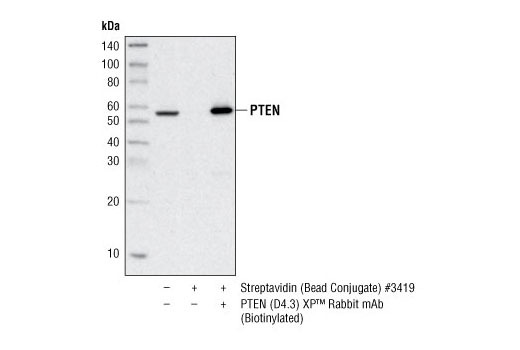 PTEN (D4.3) XP® Rabbit mAb (Biotinylated) also recognizes PTEN in these species. PTEN (phosphatase and tensin homologue deleted on chromosome ten), also referred to as MMAC (mutated in multiple advanced cancers) phosphatase, is a tumor suppressor implicated in a wide variety of human cancers (1). PTEN encodes a 403 amino acid polypeptide originally described as a dual-specificity protein phosphatase (2). The main substrates of PTEN are inositol phospholipids generated by the activation of the phosphoinositide 3-kinase (PI3K) (3). PTEN is a major negative regulator of the PI3K/Akt signaling pathway (1,4,5). PTEN possesses a carboxy-terminal, noncatalytic regulatory domain with three phosphorylation sites (Ser380, Thr382, and Thr383) that regulate PTEN stability and may affect its biological activity (6,7). PTEN regulates p53 protein levels and activity (8) and is involved in G protein-coupled signaling during chemotaxis (9,10). Myers, M.P. et al. (1997) Proc Natl Acad Sci USA 94, 9052-7. Myers, M.P. et al. (1998) Proc Natl Acad Sci USA 95, 13513-8. Wu, X. et al. (1998) Proc Natl Acad Sci USA 95, 15587-91. Vazquez, F. et al. (2000) Mol Cell Biol 20, 5010-8. Torres, J. and Pulido, R. (2001) J Biol Chem 276, 993-8. Freeman, D.J. et al. (2003) Cancer Cell 3, 117-30. Funamoto, S. et al. (2002) Cell 109, 611-23. Iijima, M. and Devreotes, P. (2002) Cell 109, 599-610.